This is not the actual 2015 F-150, but a 2014 mule using the new 2.7-liter engine and drive train. Vehicle was driven in 100 degree plus temperatures up a 13% grade. Ford has been absolutely masterful in both feeding the media pipeline with broad information and maintaining suspense about the the 2015 F-150 pickup. Now, as the launch date — still officially unannounced — gets closer, real data is being released. As promised, the engineers and designers have reduced weight by more than 700 pounds without sacrificing any performance. I expect that the unveiling may be scheduled for the State Fair of Texas since the timing is right and Ford introduced its new SuperDuty trucks at that event a year ago. Timing is also right for journalists to get some seat time prior to the Texas Auto Writers truck rodeo where the award for Truck of Texas is given. As a media event last week, the spotlight was really on the engines that will power the new trucks. I had a chance to see the 2.7-liter EcoBoost V6 in Dearborn not long ago. We were not told at that time that the engine produces 325 horsepower and 375 lb.-ft. of torque, and improvement in power-to-weight ratio of 15% over the 2014 5.0-liter with similar torque output. Also new to the numbers game are max payload and max tow rating of 2,250 pounds and 8,500 pounds respectively. These respectable numbers should please a lot of the market with mid-range capability needs. Enhancing fuel economy, also is automatic start/stop technology which shuts off the engine when the vehicle is at a stop and, when the brake is released, starts the engine quickly. The feature reduces fuel consumption and emissions. For towing or in 4WD mode, the start/stop feature is turned off. I generally avoid quoting comparative competitive comparisons provided by a manufacturer because they are sometime skewed, but the ones provided by Ford seemed interesting enough to share since they are based on the same grade that the Society of Automotive Engineers uses for its J2807 towing standard. This is the one that is being rapidly adopted by all of the truck makers for 2015 vehicles. (Toyota has used it as the standard for their Tundra trucks for several years although it remains to be seen whether the adoption by other truck makers will work in its favor.) In the results provided, the 2015 F-150 4×4 outperformed the Ram 1500 3.0-liter V6 EcoDiesel and the Chevrolet Silverado 1500 5.3-liter V8 while towing a 7,000 lb. trailer. Of less importance, I thought, was its capability in outpacing a Toyota Tacoma midsize pickup with an identical displacement 2.7-liter four-cylinder engine. I doubt that the marketplace sees a midsize pickup as an F-150 competitor even though the engines may have displacement in common. 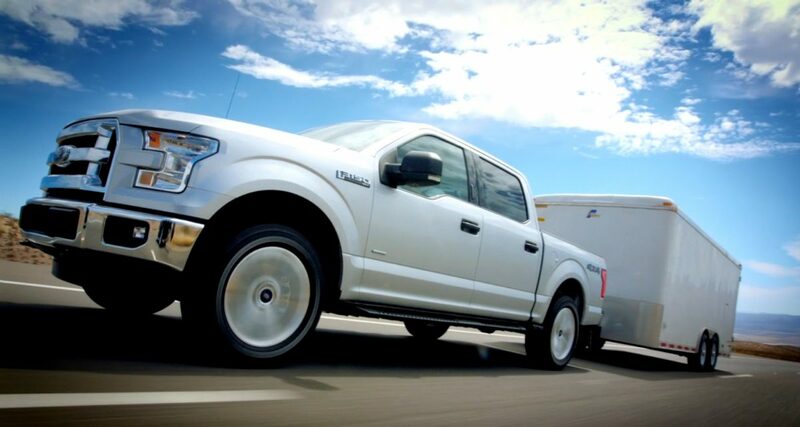 The new 2.7-liter engine is not the only new wrinkle with the 2015 F-150. 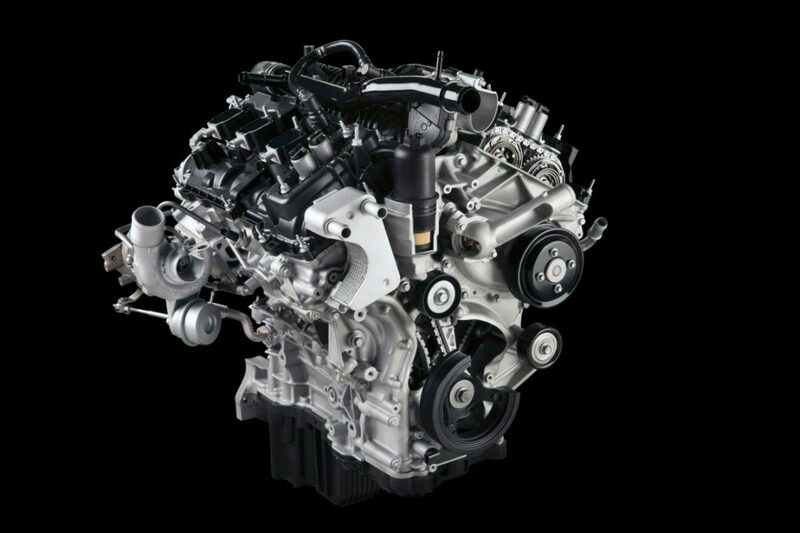 The standard 3.5-liter V6 with Ti-VCT boasts a 5% improvement in power-to-weight ratio over the previous Ford 3.7 V6, which was the standard in the 2014 model. The new engine produces 283 horsepower and 255 lb.-ft. of torque with a maximum payload of 1,910 pounds of payload and a tow rating of 7,600 lbs. Improvements in the 24-valve 3.5-liter include a valve train with direct-acting polished mechanical buckets with twin independent variable camshaft timing for impressive torque across a wide rpm range. Six-bolt main bearing caps, a fully counterweighted forged steel crankshaft and cast exhaust manifolds are designed for heavy-duty operation. Upper and lower intake manifolds, as well as the cam cover, are composite-formed for weight reduction and are tuned for responsive power. The diecast aluminum cylinder block features bay-to-bay breathing to reduce internal pumping losses and a deep-sump oil pan contributes to extended oil-change intervals. In addition to the new 2.7-liter EcoBoost and the 3.5-liter V6 engines, the 2015 F-150 options also include the popular 3.5-liter EcoBoost and the 5.0-liter V8 with Ti-VCT. No media event for the F-150 engine lineup is ever complete without someone asking about plans for a diesel on the nation’s most popular vehicle — truck or car. The answer, as with the questions about bringing the Ford Ranger to the US, is that there are no current plans to add to the truck lineup.